A natural laundry detergent is an alternative to a detergent based product. These natural products don’t contain perfumes or any other chemicals that may cause irritation. There are pros and cons with each. You can decide which one, if any may be worth a try. Do You Have A Natural Laundry Detergent Story To Share? These are organic and natural. They grow on the Soap Nut Berry Tree. They contain soap called Saporin. The soap is released when the nuts come into contact with water. They are free from perfumes, dyes and other chemicals. But they still do a good job of getting clothes clean. They don’t have added whiteners or enzymes that help remove stubborn dirt. You could use bleach or a stain remover if needed. Although these products may have chemicals in them, the overall amount is far less than if chemical filled cleaners are used. 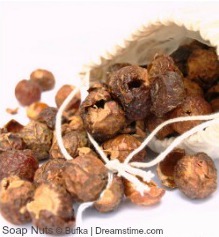 Also the soap nuts are not affected by adding them to the wash. The nuts are used by putting 5 in a bag and being left to soak for 5 minutes. They are then put in the machine drum along with the clothes. They can be used in your normal wash cycle, and be used in temperatures between 30 and 90 degrees. So good on all fabrics, even silk and wool. They don’t smell pleasant but the smell doesn’t stay on your clothes. Your clothes come out smelling fresh. If you like a fragrance to your washing you could always add an essential oil. Put a few drops of your favourite oil on a damp cloth and put it in with your clothes. Being chemical free they wont irritate your skin or pollute your water. They are economical to buy, costing around 4p a cycle. So money saving too! 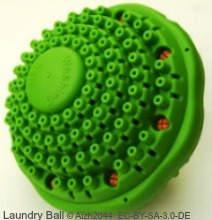 Also known as a laundry ball, these are natural and good for the environment. As the name suggests they are balls! They go in your washing machine drum. 3 balls are used. They can be reused for up to 1000 washes. This makes them very economical, at around 3p a wash. The balls and the action of the washing machine together produce ionised oxygen. This gets the water working to remove dirt. You can use them on a cooler, quicker wash.
30 degrees is ideal, so they can help lower electricity costs too. As they don’t have any added chemicals they may also need help with stubborn stains. Some places where you can buy the balls will give you a free stain remover. They are also readily available on the internet. There are several different makes, so reading about them may help with buying the best ones out there. 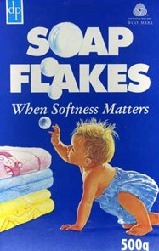 Soap flakes are a natural laundry detergent as they are made of pure soap, normally 100% vegetable based. They don’t contain any enzymes, perfumes or bleach. They can be used in the washing machine or for hand washing. They are gentle on delicate fabrics, and also on our skin. They work well on waterproof sports and outdoor clothing too. You can also buy them to make your own soap. Ideal if you want a soap that is safe for your skin. You will know what ingredients are in it. It will also may nice presents! They can be brought online and in chemists and supermarkets. If you are using any of the natural alternatives you will find that they keep your fabrics soft naturally. They wont leave a residue on your clothes. When using the conventional washing powders and liquids they leave a residue on your clothes. It builds up each time, for up to 10 washes. It actually increases the weight of your clothes! The amount of residue left after 10 washes is the same amount of powder or liquid that is used in 1 wash. If you change to a natural laundry detergent, you will be able to wash out the residue left on the clothes. Though it can take quite a few washes to remove it all. If its on your baby's clothes it might be easier to buy some new clothes. By the time the residue has been washed out your baby will have grown out of their clothes! Also if you change over, its a good idea to get rid of any powder or liquid left in the machine. Just run it on a hot empty wash. It gets rid of it so it cant get on to any of your clothes that you wash in the future. It is worth taking the time to figure out the best product and routine for you. Washing products tend to be full of substances that are far from beneficial to the skin. The natural route seems to be the best way to go, but it doesn’t suit everyone. Mainly because of the worry of getting clothes properly cleaned. They seem to be good at general cleaning, its just the stubborn marks that may prove an issue. Even more so if you have children! But there are ways around it. Like everything, different products will suit different people. You may decide to try a natural laundry detergent or stick to a product you know. 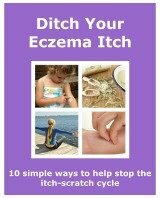 Preventing skin irritation is more than just what product to use. Read How To Wash Clothes, for some laundry tips to help prevent an allergic reaction.